It’s unfortunate that in reviewing a movie as generally strong as Hands of Stone, I feel obligated to make my first note a complaint. 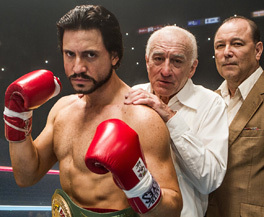 But in light of the now-constant Hollywood tendency to rely on white actors when it comes time to tell non-white stories, the first thing that must be said about the Roberto Durán biopic is clear: It’s ridiculous that this story is told by trainer Ray Arcel. To be clear, Arcel’s role in Durán’s career is significant. The trainer’s life story is a compelling one on its own, and could easily be the subject of another film. But not only should this story focus much more clearly on Durán himself — played beautifully by Édgar Ramírez — it should absolutely not be narrated by Arcel in a by-the-numbers portrayal by Robert De Niro. It’s reductive to assert, even in passing, that this tale is Arcel’s to relay. And while such decisions are always problematic, this one in particular is distressingly so, given how intimately Durán’s life was tied into Panamanian pride and that nation’s struggle against American control of the Panama canal. When a fine film has this big of a flaw, it’s hard not to lead with it. Which is certainly a shame, because it is otherwise a vibrant biography long overdue for a big-screen adaptation. Durán escaped poverty by virtue of his successes in the ring; his later rivalry with Sugar Ray Leonard (played by Usher, in a breakout performance) is one of the most compelling pugilistic tales of the 20th century, done blessed justice here.